Minnesota Recruiters is heading back to our brand new event space at the Mall of America! Join 400 Recruiting professionals on Wednesday, May 13th, 2015. Join us on Wednesday May 13th for a 1/2 day of incredible content and training for Talent Acquisition and HR professionals, featuring 3 national speakers! The lineup includes Annie Chae, Carmen Hudson, and Chris Forman. The focus of the day is all about building your skills in sourcing, recruiting, candidate research, competitive intelligence and networking. 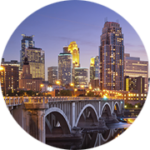 If this is your first recruiter training event with Minnesota Recruiters, see what other conference attendees are saying. Continental breakfast, beverages and snacks will be served during the registration and break from CRAVE catering, and are included in your registration. Talent Research and Competitive Intelligence: The shortage of skilled talent is a strong consideration in the marketplace. As recruiters work to fill open requisitions and attempt to build pools and pipelines of talent, knowledge of the competitive landscape as well as knowledge of the talent supply and candidate research is essential to success. Annie Chae wills show us free and nearly free tools that can give us an overview of the available talent and how to use that information in a talent sourcer’s or recruiter’s workflow. Social Sourcing & Talent Outreach: In today’s market, it’s tougher than ever to source and recruit top talent. This results in the need to approach some of the oldest recruiting and sourcing challenges with innovative solutions. Join Carmen Hudson to hear some of the industry’s leading tips and tools. She’ll share strategies and approaches for winning social sourcing and candidate outreach. Annie Chae a.k.a. idea girl, disruptor and strategist, Annie’s endless curiosity drives her to reimagine how competitive intelligence(CI) is an exceedingly critical part of developing positive candidate and client relationships, increasing leads and a life-long customer base in the relationship business of Talent Acquisition. Annie’s business talents started at a young age and bloomed a bit more while helping her immigrant parents manage their family businesses. After graduating from Indiana University, Annie set on a path following her parents’ vision of entrepreneurism…but not until she dipped her toes in the corporate world first. Before joining Microsoft, Annie was at Booz Allen Hamilton, implementing strategic recruitment programs known as Research, Critical Sourcing and SWAT. She created an internal certification course called Black Belt Bootcamp for advanced talent sourcers and recruiters. Prior to Booz Allen, she refined her research and recruiting techniques by developing the sourcing ecosystem map as the Associate Director of Talent Sourcing at the Corporate Executive Board (CLC). Earlier on in her career, Annie had served as a full life cycle recruiter for multiple teams at BearingPoint as well as a Sr. Research Associate at A.T. Kearney Executive Search. Along her journey at Microsoft, Annie has collaborated with many wickedly talented colleagues…mixing mad science skills with operational excellence to launch Staffing Compete, a global talent research/CI program, across the company in 2012. She brought a wealth of industry expertise to this critical and highly visible role, including staffing leadership and sourcing strategy creation, human capital research, organizational mapping, market intelligence and direct sourcing. Upon the success of productizing HR and talent research globally at Microsoft, Annie decided it was time to leave Corporate and embark on her own story. She founded talentCI LLC in September 2014. Annie has found her nirvana in the heart of Seattle Washington, enjoys practicing yoga, strengthening her mind and soul at the gym (admittedly defeated by her trainer too), volunteering at YouthCare, and hanging out with her husband and 170 lb bull mastiff in Belltown. Chris Forman is the CEO and Founder of StartDate Labs Inc., the parent company of Appcast.io and StartWire. As the former Chief Executive Officer of AIRS and Chief Development Officer of The Right Thing, Chris has worked in the recruiting industry for 19 years, developing smart recruiting tools that have helped hired millions of people around the globe. Chris is a nationally recognized expert in recruiting and talent management and has been quoted in publications such as The Wall Street Journal, The New York Times and SI Review. Carmen Hudson wears several hats. She is currently Principal Consultant, Sourcing and Social Media Strategy for Recruiting Toolbox, Founder and CEO of Tweetajob, Inc. and co-founder of a national conference for tech recruiters, Talent42. Carmen draws from over 15 years of recruiting experience, with a strong focus on helping organizations attract, source and recruit top talent. Her expertise is in helping clients build the right sourcing and recruiting strategies, and implementing them in the real world of limited budgets, competing priorities and highly competitive recruiting environments. Carmen consults and trains companies to help them leverage high ROI solutions for big sourcing, social media and technology implementation initiatives. Jason Buss. With 20 years of global human resources and talent acquisition leadership experience, he is a recognized expert with deep experience in identifying, recruiting and hiring high-performing teams. As recruitment innovation officer for SmartRecruiters, Jason helps build awareness, visibility and advocacy for the new way of hiring. Jason is also the creator and editor of Talent HQ, a premier online news and information channel for the recruiting and human resources community and is the president and community leader of Minnesota Recruiters and California Recruiters, the nations largest and most active regional recruiting communities. Consistent with all Minnesota Recruiters events, registration and availability is on a first-come, first-serve basis.